There’s a new desktop snap in the Snap store: Discord. 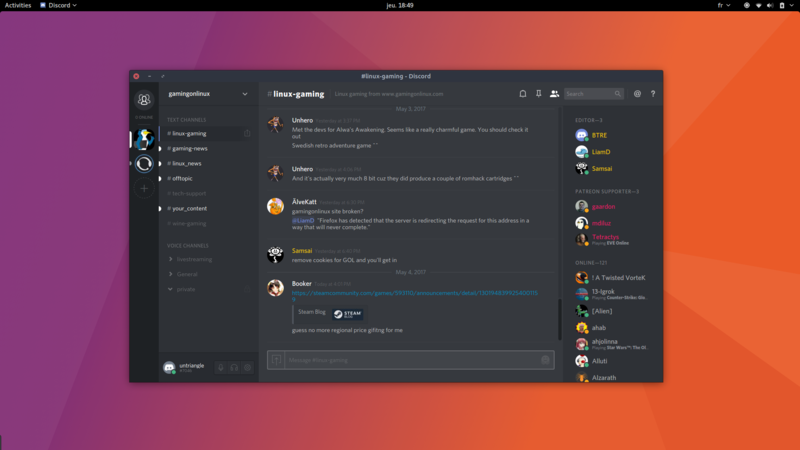 Within 1.5 years of its launch Discord has become an almost mandatory tool for gamers. Adoption has been wild, from streaming to a Twitch account to voice calls to sync up on gaming tactics. But Discord can also be used as a VoIP replacement and has been praised for the crystal clear quality of its audio calls. 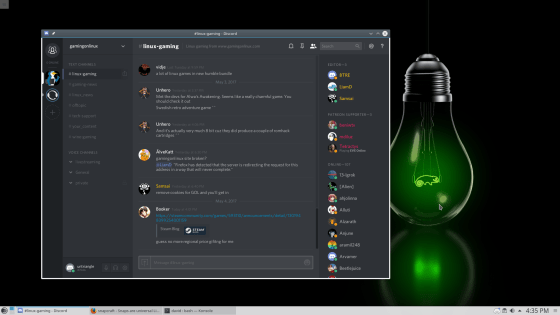 Just like the user growth has been amazing, the technology behind Discord is rather exciting. In particular they get their backend to work hard to make the load on the clients as light as possible. But Discord’s approach on the client is not too dissimilar to what you would find on Google Hangout or Skype. Just like them, they use webRTC to do voice or video communication. Just like Skype they package their application using Electron, the web framework to build cross-platform applications. So why does it make sense to have Discord packaged as a snap? Snaps mean simple installation and update management with no need to worry about dependencies. It also means that when the software vendors make them available, it’s easier to access the beta version of their app or even daily builds. 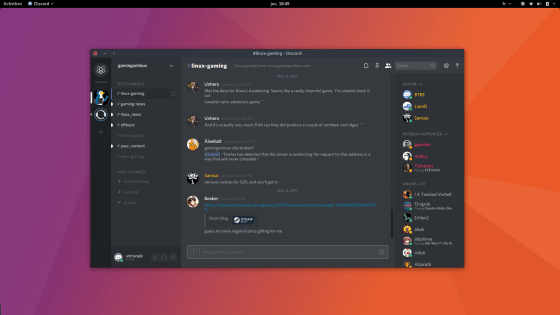 For app developers snapping your Electron applications for Linux users means building one snap that works on all the major Linux distributions, with support for more distributions growing at the time. User install documentation can be simplified and your application will be discoverable by millions of Linux users in the Software Center. Application developers are in complete control of the publishing and release of their software, it drastically simplifies support as they can control the version of the app being consumed. Once a snap is installed, it will automatically be kept up to date, with install metrics available from the snap store. No more having to maintain old versions or asking users to update first before reporting bugs. 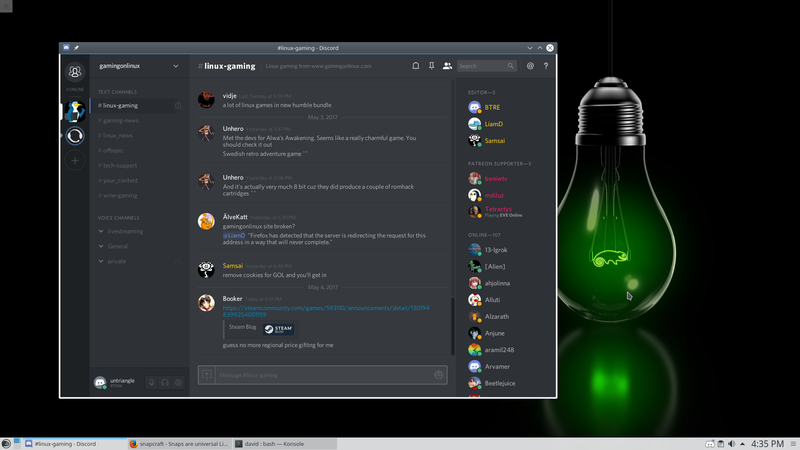 The Discord snap running on openSUSE Leap 42.2. 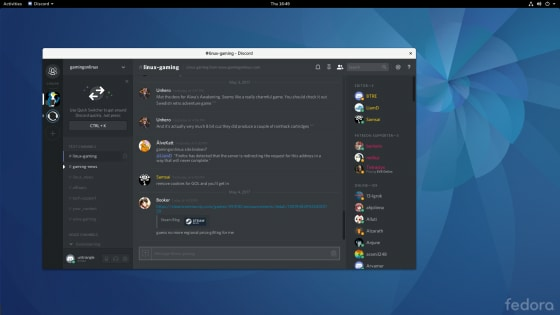 The Discord snap running on Fedora 25.